Matt Groening confesses that he has never seen an original episode of Star Trek in its entirety. He explains that he didn't dislike the show, but just never watched it. He felt that this could help the episode by judging the jokes without knowing what they are alluding to. Past usage of the distinctive wheelchair, both in The Simpsons and Futurama. Pat Shinagawa was a Star Trek fan as a child, but since then never watched it then until directing this episode. Many of her colleagues at Rough Draft Studios were jealous of her directorial position. David X. Cohen concludes that they picked the best series to create a parody of. David A. Goodman mentions his work on this episode got him a job writing for Star Trek: Enterprise. Original ideas for the episode, including a battle between a giant William Shatner and Leonard Nimoy. The story behind getting all of the original Star Trek cast members to play themselves in the episode. The only actor to reject the offer was James Doohan. Goodman then titled the original script "We Got Everybody Except Scotty." Goodman confirms to Maurice LaMarche that all listed episode numbers in one of Melllvar's lines are correct. Discussion of the two returning Star Trek characters in the show, Leonard Nimoy and Nichelle Nichols. Matt was nervous of being questioned by William Shatner on his knowledge of the show. Billy West also had a conversation about Futurama with William Shatner. Leonard Nimoy and William Shatner were the only two actors who were allowed to converse their lines into the same microphone during the recording process. Cohen tells the story of squishing everyone into the Recording Booth to watch their idols act. Goodman speaks of his moments urinating next to Leonard Nimoy. The episode was approved of by the fans at the Pasadena Star Trek Convention. A line of Melllvar's was intended to have a strong tone, but Maurice felt it needed to be softer and a softer tone was used instead. Cohen questions the phasers moving away from each other at the ship, but meeting each other at their target. Cohen describes several early versions of Melllvar. Goodman mentions references to Star Trek that were missed by fans. 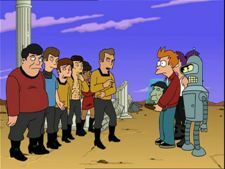 Goodman talks about his yearning to write the planned Star Trek episode for Futurama. Cohen admits he was keeping quiet about who would be writing the episode because he was trying to find time to write it himself. Cohen talks about John DiMaggio and himself laughing so hard at the table read of this script they cried. A series of maladies left Goodman with very little time to write the episode. The commentators wonder the inspiration behind Dan Vebber's line on Melllvar's age. Cohen asks Pat about dealing with lawyers throughout her time directing the episode. William Shatner's spoken word cover of Elton John's "Rocket Man." The various background for the closing credits. David X. Cohen: He's not joking by the way. David Goodman now writes for Star Trek: Enterprise. David A. Goodman: And that will be the next series that I put in the ground. Matt Groening: And James Doohan wouldn't do it because he wouldn't do anything or...? David A. Goodman: Well the quote we got was "No way." Matt Groening: A simple 'no' would have been sufficient! David A. Goodman: "No way!" Maurice LaMarche: The 'way' was quite unnecessary. This page was last edited on 31 January 2014, at 17:36.